...had developed a rather large hole!! The question is: Can it be fixed? 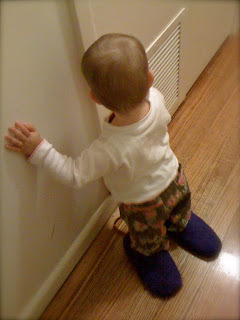 They're felted slippers from somewhere (can't quite remember where) that are really cozy and warm. The hole seems to have developed in the fabric near the join to the sole (but not in the seam) along the toe line. I'm stumped. I'd love to fix them but don't know where to start! What do you suggest? 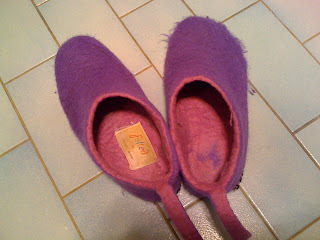 Can they be saved, or should we just decommission them and relegate them to the dress-up box? Find lots of creating going on over at Kootoyoo! *In the loosest sense of the word. Possibly a mild (cough) overstatement. I like your humour. I say decommission but perhaps I'm unfeeling towards husbandly crises. ummm... try & fix them in a way you see fit. If it doesn't work, bummer but you tried & dressups here we come! lol Good luck. Er, could you unpick them and felt more bits on? Is that how felting works?? Yeah, can't you just hand felt over the hole?? Actually I've never done any stab it with a needle type felting so not sure how it would work, but might be worth a try. Good luck. anytime a favourite anything becomes like that it is a definite crisis!! Make him wear them until father's day when he gets a new pair!